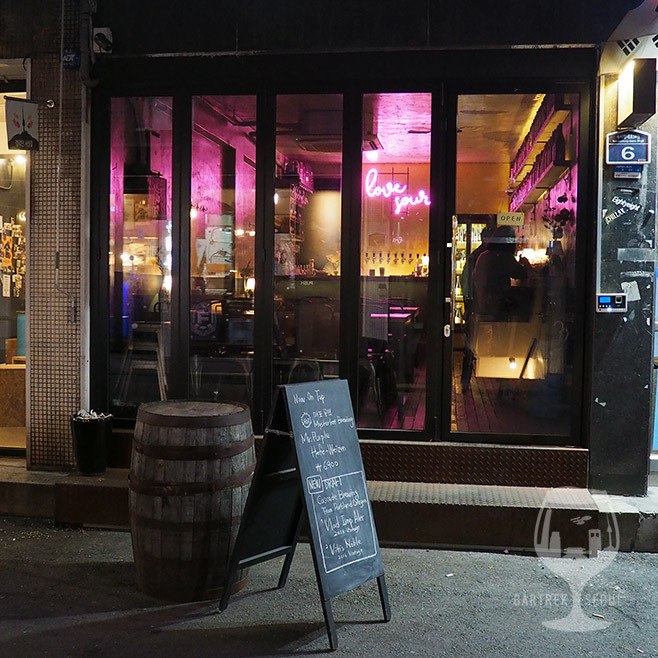 If you are tired of the typical ales and lagers of the noisy Itaewon bars, but don’t want to venture too far from known territories, Sour Pongdang in Noksapyeong might be worth a visit. 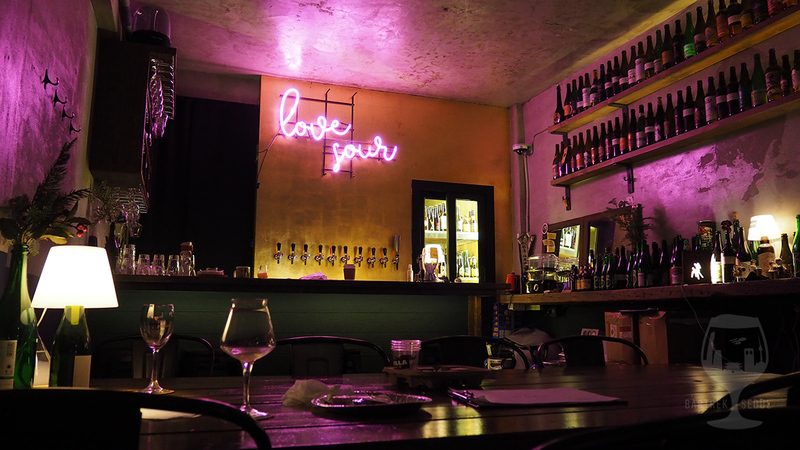 Right across the street from Woori Super, The Booth and Magpie, this place covers the sour end of the beer scale and offers a different atmosphere. This shot is our absolute favourite. The venue itself looks amazing, and it is like visiting a painting. 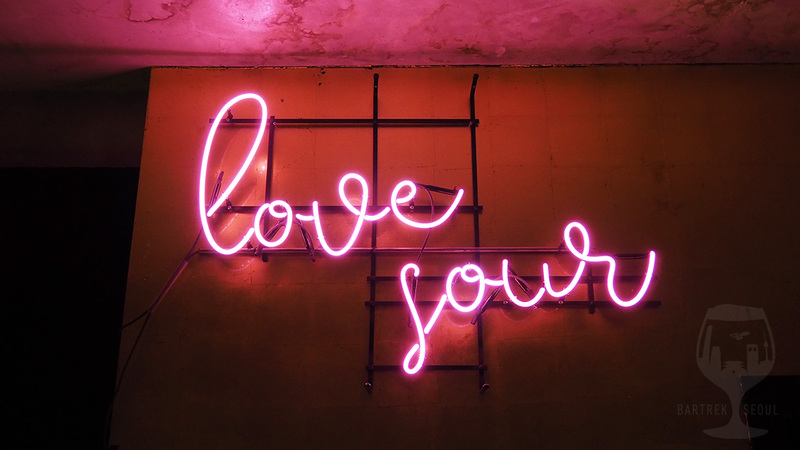 The pink Love Sour neon sign sets the mood, casting lush tones on the concrete walls lined with uncommon bottles on industrial shelves. 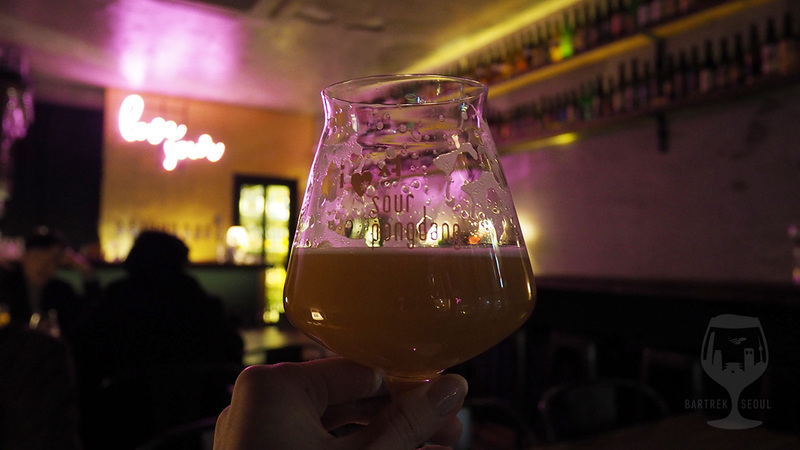 Sour Pongdang’s menu includes sours and special brews from mostly Korean, US and Belgian breweries, with tastes ranging from friendly and available to ungodly sour. If you are looking for something unique to challenge your idea of beer taste, this is the place. Glass of their own pale ale and sour ale. 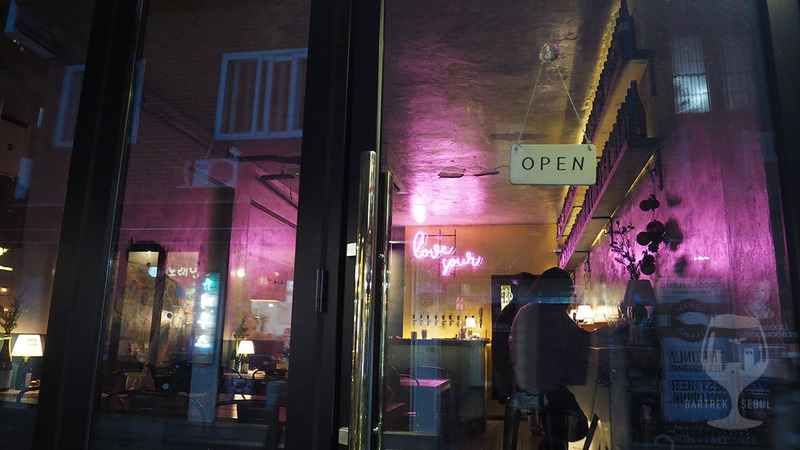 Off their Korean menu, the Surleim collaboration is a great start. It is sour and tasty, and comes in just the right amount. Their own Be Happy Pale ale is a solid pale ale if you want to start off easy. Well balanced and hoppy, leaves very little to be desired, one of the better ones in Seoul at the moment. 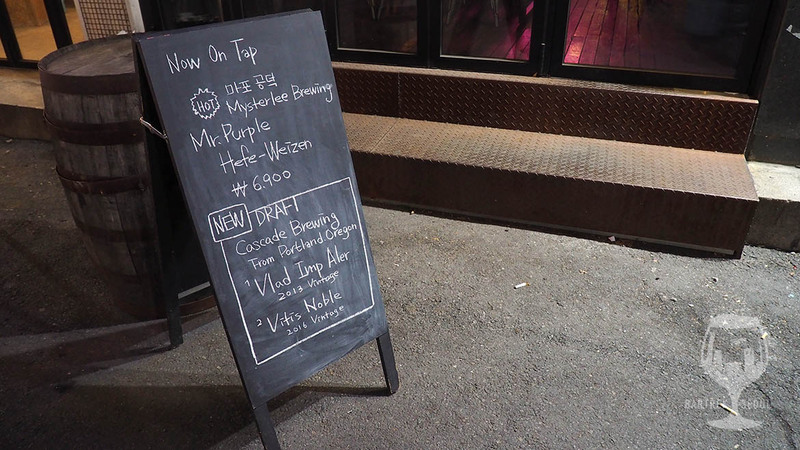 Their tap menu is not as impressive as their fantastic bottle selection, and both include a few cheaper and plenty of pricier choices. Choosing your next beer becomes difficult, another good reason to bring a friend or three for a tasting session. Several of the beers are only available in large bottles, perfect for sharing! Flipping through the pages, you can see familiar names like Lindemans, Timmermans, Boon, Stillwater, Upright, Cascade, Evil Twin.. and the unholy flavors cannot be stressed enough. Grape fruit Berliner Weisse, Barrel Aged Ale with hyssop leaves and ginger, Coriander and orange zest lambic, Smoked sour wild farmhouse wheat ale and we’re not even touching the weird stuff! Pay attention to the bitterness and alcohol content as you scour the menu and try to plan out a good tasting order, or some of the weaker beers might lose their edge. Small and compact pub with good atmosphere. Though the interior is of the more picturesque in the area, the seating is a little odd. 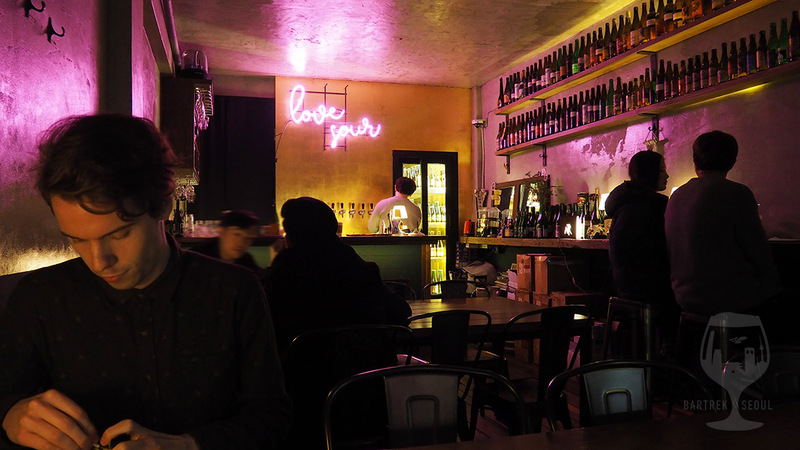 With two huge, HUGE, tables, one long table along the wall and a few seats near the bar, be prepared to mingle with other guests when the place fills up. The tables are so wide conversations become a little difficult sitting across from each other, even there are only a few other guests conversing around us. The music is at a decent volume and well varied, normal radio tunes with the occasional rap song, but nothing to kill the mood. Time for another one soon. Some more narrow seating on the right wall. 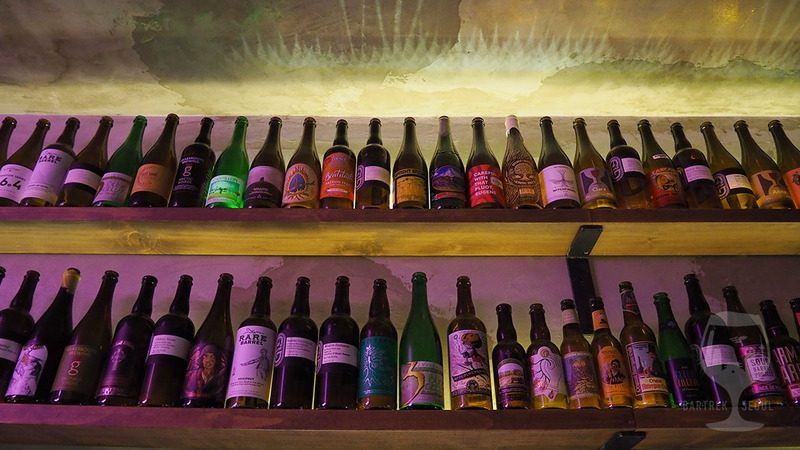 A dozen of sour beer bottles decorating the top of the wall. A monument to all their sins, these empty bottles give an idea of the variety to be had at Pongdang Sour. Definitely recommended for anyone willing to experiment, although naturally a little pricy compared to more common choices. Having the fridge visible in the back is an interesting choice, especially since Woori Super is right across the street with cheaper prices and a few of the same bottles in stock.. There is though a small discount for taking out bottles, and some bottles are even on sale. The staff is friendly and English is no problem. There is a little food menu with tasty looking cheese, sausages and even Monster Pizza from across the street. This neon sign really gives the pub its soul. Close up to the empty beer bottles. 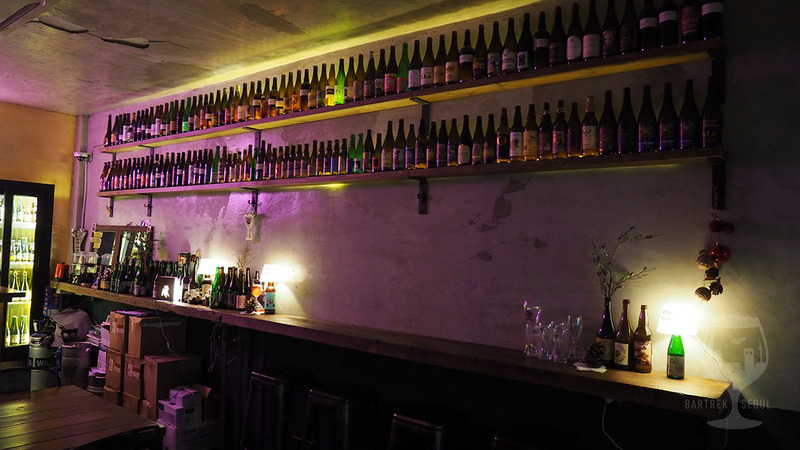 This place really offers a wide variety of beers, from pleasant oddities to insane barrel aged sours that will make you question your sanity. 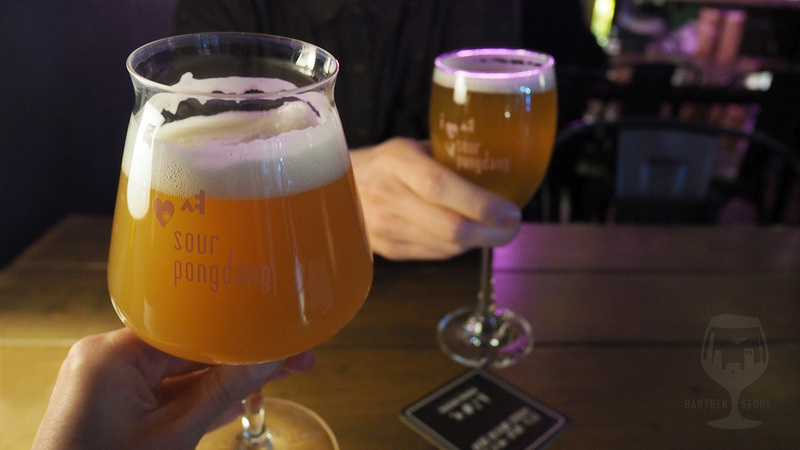 If you want to broaden your beer horizon and push your taste buds to the limit, Sour Pongdang is well worth a visit. You can see the unique atmosphere of this small one-room pub from the streets.